Congratulations, your registration for Greater San Diego Association of REALTORS® is complete. You are now logged into Greater San Diego Association of REALTORS®. Greater San Diego Association of REALTORS® admits students of any race, color, or national or ethnic origin to all the rights, privileges, programs, and activities generally accorded or made available to students at Greater San Diego Association of REALTORS®, and Greater San Diego Association of REALTORS® does not discriminate on the basis of race, color, or national or ethnic origin in administration of its educational policies, admission policies, scholarship and loan programs. Don't miss this opportunity, click here to purchase. COMPLETELY REVISED! Baby Boomers represent the largest and wealthiest group of buyers and sellers in the country. 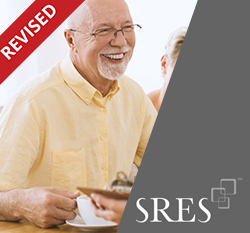 Understand what motivates this growing market and how to address their needs with the prestigious SRES® (Seniors Real Estate Specialist®) designation. Membership in good standing of the SRES Council. The first year of membership is FREE to students who enroll in this course. Annual dues are $99 each year thereafter. Membership in good standing in the National Association of REALTORS® or an NAR cooperating association, including the Canadian Real Estate Association. Bonus! The SRES® designation course counts as elective credit for the ABR® and CRS designations. It also counts as elective credit for the RSPS certification. For more information, email sres@realtors.org or visit www.SeniorsRealEstate.com. If your state is not listed below, you may take the course and benefit from the knowledge and enhanced professionalism, but you will not receive CE credit. Unless otherwise noted, the hours indicated below fulfill elective credit requirements. Illinois The CE Shop Inc.
New Jersey The CE Shop Inc.
North Carolina The CE Shop Inc.
Texas The CE Shop Inc.